When I was a little girl, I went to an urban elementary school in Nashville, Tennessee. I remember the first time I heard Martin Luther King, Jr.’s “I Have a Dream” speech. We filed onto the cafeteria stage with the curtains drawn to make a small dark theater. We sat with criss-crossed legs on the wood floor as a VHS played and the musical, prophetic words of King washed over us. Tears welled up from somewhere deep within my first grade soul. I responded to King’s call for justice like a tuning fork, like a summons. This fall, seventy students and I studied King’s “Letter from Birmingham Jail” in tenth grade English at King’s High School. 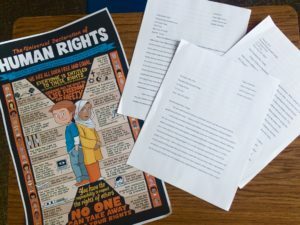 We studied argumentative writing and rhetorical techniques, but we also looked at the power of an individual voice to change the tide of a culture and to speak on behalf of the marginalized and oppressed. After that, we looked at the Universal Declaration of Human Rights, adopted by the U.N. at the urging of Eleanor Roosevelt in 1948. The UDHR was a direct response to the atrocities of WWII and sought to create a better world where all people would be free, safe, and dignified. “The NSA mass surveillance of millions of people must be stopped because it violates human rights. Specifically, it violates article 17 of the International Covenant on Civil and Political Rights, which states, ‘No one shall be subjected to arbitrary or unlawful interference with his privacy, family, home, or correspondence, nor to unlawful attacks on his honour and reputation.’… If the United States fails to comply with regulations to which it has an obligation, how can any other country be expected to follow these regulations?… In the words of Franklin D. Roosevelt, ‘Freedom means supremacy of human rights everywhere. Our support goes to those who struggle to gain those rights or keep them. Our strength is our unity of purpose. To that high concept there can be no end save victory.’” –Robin Cheung, King’s 10th grader. I am proud of my students. They have begun to embody the power of the early church, as described by Dr. King: “…the early Christians rejoiced at being deemed worthy to suffer for what they believed. In those days the church was not merely a thermometer that recorded the ideas and principles of popular opinion; it was a thermostat that transformed the mores of society….” Perhaps in time they, too, will develop strong voices like King and see freedom ring in greater measure in our world. Joanna Roddy has been teaching in the King’s High School English department on and off since 2005. She also writes novels, travel articles, and is a regular contributor and co-founder of Kindred Magazine, an online monthly literary publication. Joanna lives in Edmonds with her boat-designer husband, daughter Avonlea (7), and son Corin (4).